Many home gardeners who grow fruit trees know that pruning is essential for best production. However, most don’t realize that a little training will make the tree more productive. 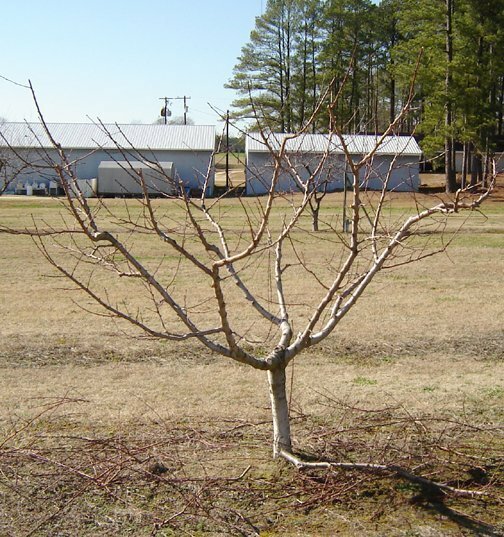 There are two basic systems with several variations on each used to train fruit trees. The first system is the central leader system, where a central or main trunk is developed with lateral branches coming off the trunk at regular intervals. 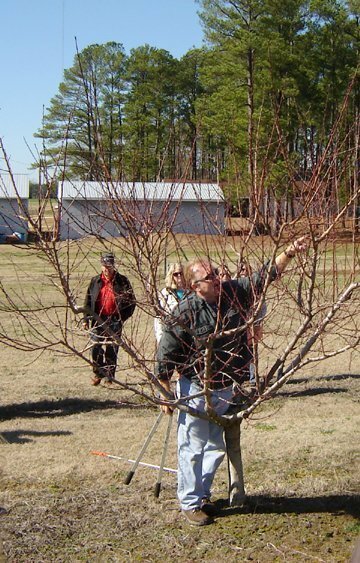 Fruit trees typically pruned using the central leader system include apple, pear, pecan, cherry, and plum. When using the central leader system the overall shape of the tree should resemble that of a Christmas tree—broader at the base and narrow at the top. Depending on the overall size of the tree, whorls of branches should be spaced about 18 to 24 inches apart. A whorl is a set of three to four branches encircling the trunk of the tree at roughly the same height. The 18 to 24 inch spacing allows light to penetrate deep into the center of the plant. Fruit trees need light to produce flower buds and tasty fruit, so the deeper the light penetrates into the tree the more fruit the tree can produce. With a young tree the branches can be spaced by cutting the central leader about six inches above where the whorl of branches is desired. The first two or three buds below the cut will compete to become the central leader. When these buds are about six to ten inches long select one to be the leader and remove the other two by pushing them off to the side. Further down the tree the branches will have a wider branching angle. Branching angles of 60 to 90 degrees provide very strong branches for producing fruit. Even branches with good branching angles will want to turn and grow straight up. To prevent this from happening branch spreaders can be used to train the branches to grow out rather than up. Branch spreaders can be commercially purchased or made from one-inch square lumber that has a finishing nail driven into each end and the nail head cut off. The nail provides a good anchor into the tree branch and the trunk. Another option for spreading the branches is using weight to pull the branch down. 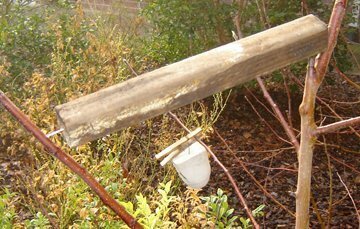 Caution should be used with weights, as branches that grow below horizontal will be weak and less productive. As the tree begins producing fruit, the fruit will act as the weight to pull the branches down. The second basic pruning system is the open center system. 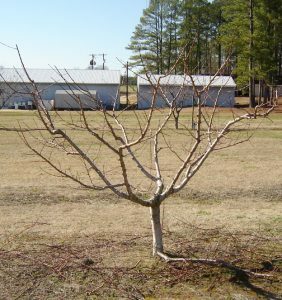 Peaches, nectarines and plums are examples of trees that are often pruned using this system. Using the open center system keeps fruit lower to the ground where it can be picked, and opens the center of the plant allowing fruit production along the entire length of the main scaffold or lateral branches. To begin training a tree to this system, cut the top out of the tree in the spring before bud break, about six to ten inches above the desired height of the scaffold branches. If your tree already has lateral or side branches, select three to five of these side branches to keep as the scaffold branches and remove the top and all other side branches. Weights may be needed to keep the branches growing out rather than up. Trees grown with this system usually begin fruiting after the second or third year. 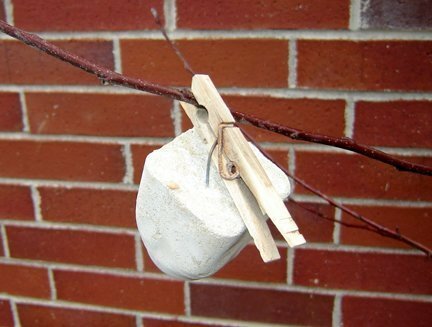 The fruit will then act as the weight to keep the branches growing out rather than up. Each year the tips of the branches will need to be removed to encourage lateral branching to fill the entire space. 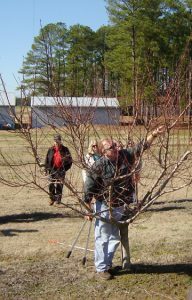 For more information on training fruit trees do a web search for videos on training and pruning fruit trees or call your local extension office and ask for the publication on training and pruning fruit trees. Photos courtesy of Shawn Banks.